I like these new purple plates but I'm not sure they look that great in photos. Yesterday was a big day for the ol' Shannons. As many of you know, our kitchen in Norfolk was about the size of a bathtub. 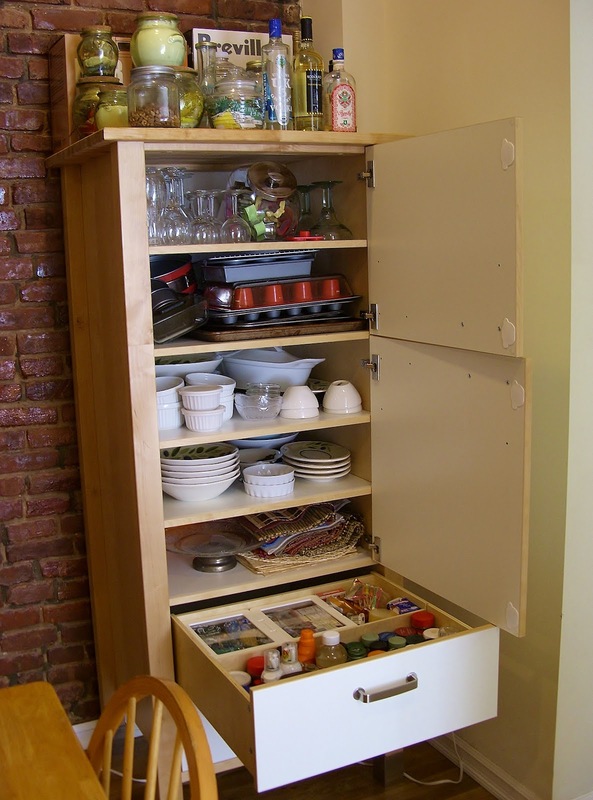 One of the selling points of our new place in Brooklyn was the bigger kitchen. 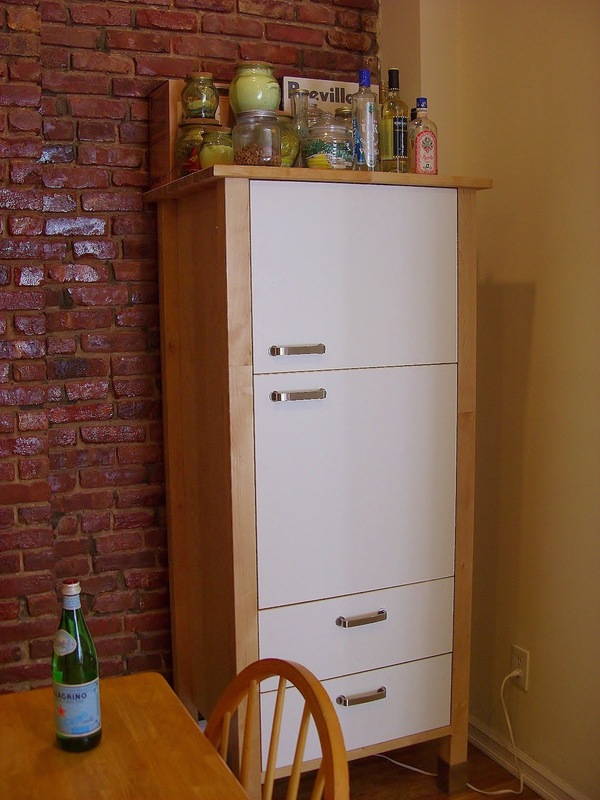 There was room for a kitchen island to increase the counter space, and of course there was the coveted exposed brick. But even with all this upgrading, we were only half way to our dream kitchen. We needed something extra for all our pretty plates and schmancy wine glasses and all those random grains I like to experiment with and other random yumminess. That's why last weekend my handsome husband built me a Tardis! Click on these photos to enlarge. 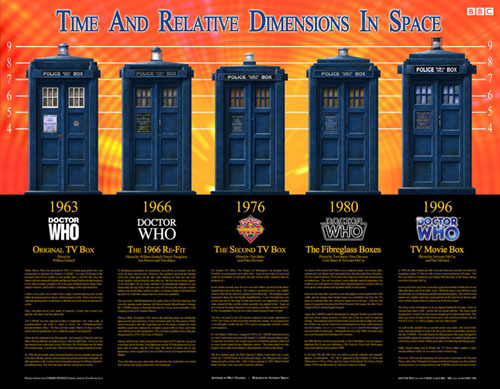 Now if you don't watch Doctor Who, you might not know what a Tardis is or what the hell I'm talking about. 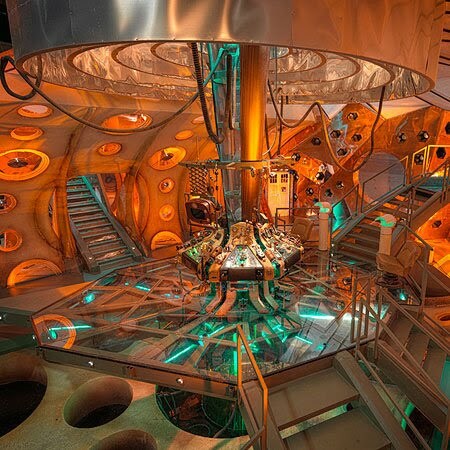 See, the infamous Tardis was created by the Time Lords to travel through time and space and is able to blend into it's surroundings using something called the 'chameleon circuit' while having the mystifying ability to be larger on the inside. Our new 'Tardis' not only matches all our kitchen gear but has pretty much doubled our cabinet space. 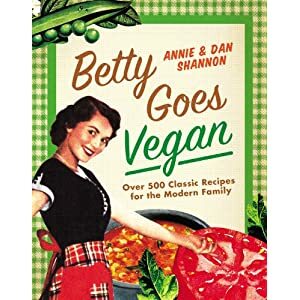 This one addition to our kitchen is what I am calling a game changer and is pretty much one of the best things to ever happen to the Shannon kitchen since we starting making the vegan fried egg! Check out how much it holds! The only downside is that construction took up most of the kitchen Sunday but even without a kitchen... there is always the slow cooker. 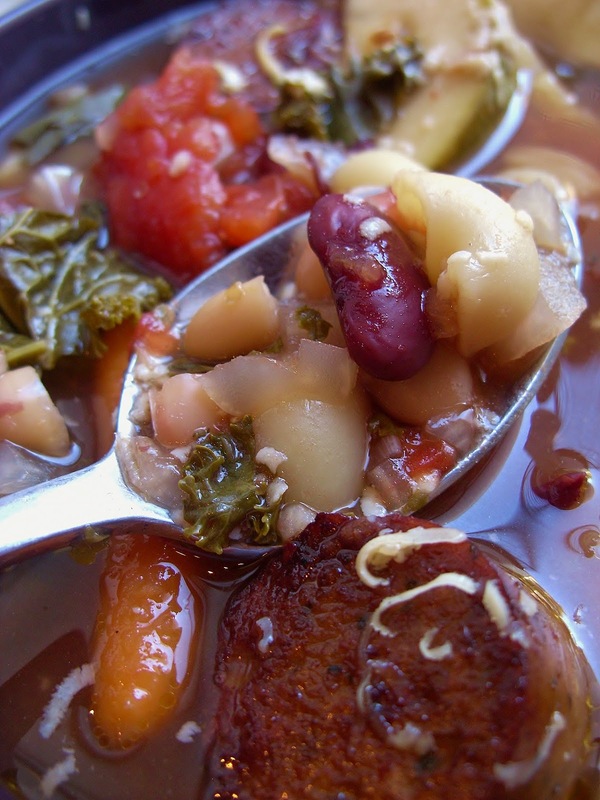 Minestrone is a thick soup that is as common on Italian dinner tables as pasta. 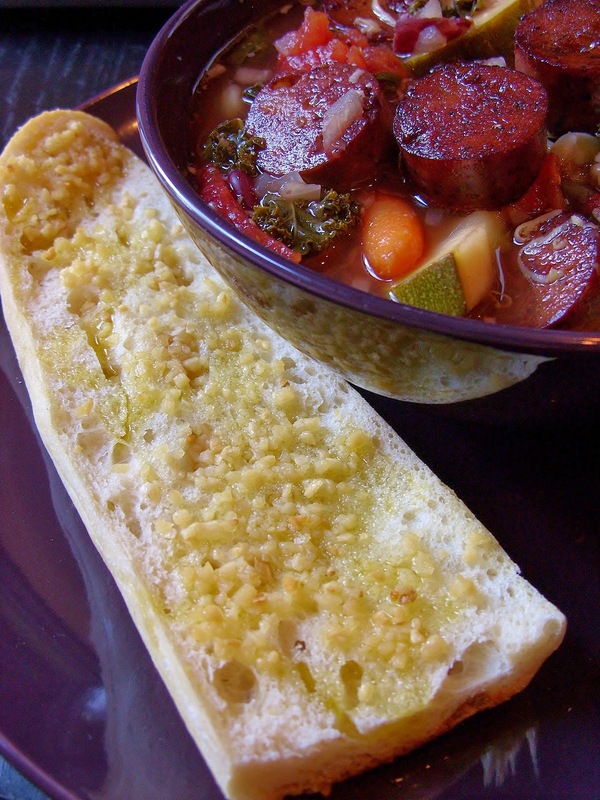 It is also one of those soups that it is easy to take for granted because it is often already vegan but this one includes some vegan Italian sausage to make it a complete meal in a bowl. It's an easy dinner that pretty much makes itself. This soup is also kinda like The Doctor's Tardis ironically enough. It's full of way more vegetables and subtle savory flavors than you would think. We had ours with some Olive Oil Garlic Toast - a recipe I am sharing for those folks who love garlic bread but are trying to avoid the palm oil in most margarine. I actually think I might prefer the olive oil version but I'm a sucker for olives and olive oil and all things even a little related. The downside to the slow cooker is pretty obvious. It's slow. This soup takes about a half hour to prep for and about 6 hours to make. So we should get started! Sometimes it can be hard in photos to show what is happening in a soup... hope this helps! Toss all ingredients except Pasta, Vegan Sausage, Olive Oil, 1 Tablespoon Red Wine, Sheese, Salt and Pepper into the slow cooker and set it to high. Every 45 minutes, stir your soup while the vegetables cook down to keep the vegetables on top from drying out and break up the Tomatoes. Do this for about 5 and half hours. Once your carrots are tender, add your Pasta. Cook for 10 to 15 minutes or until your pasta is tender. Then Salt and Pepper to taste. While your Pasta is cooking, cook your Italian Sausage Coins in Olive Oil and Red Wine. Heat the Oil at a medium heat in your beloved cast iron skillet. Once your Oil is warm, toss in your Italian Sausage and pour the Red Wine over the Sausage. Let brown evenly, flipping a few times, until the edges are crispy and you have a even coating of Oil and Red Wine on the Sausage. When you serve, fill your bowl and sprinkle some Vegan Sausage Coins over the top and then grate Smoked Cheddar Sheese over the top like you would Parmesan. Mix your Olive Oil and Garlic in a small bowl. Then drizzle the Garlic Oil over the top and put in the oven for 5 minutes or until it has toasted the desired amount. We toasted ours pretty light this time because we were eager to eat. 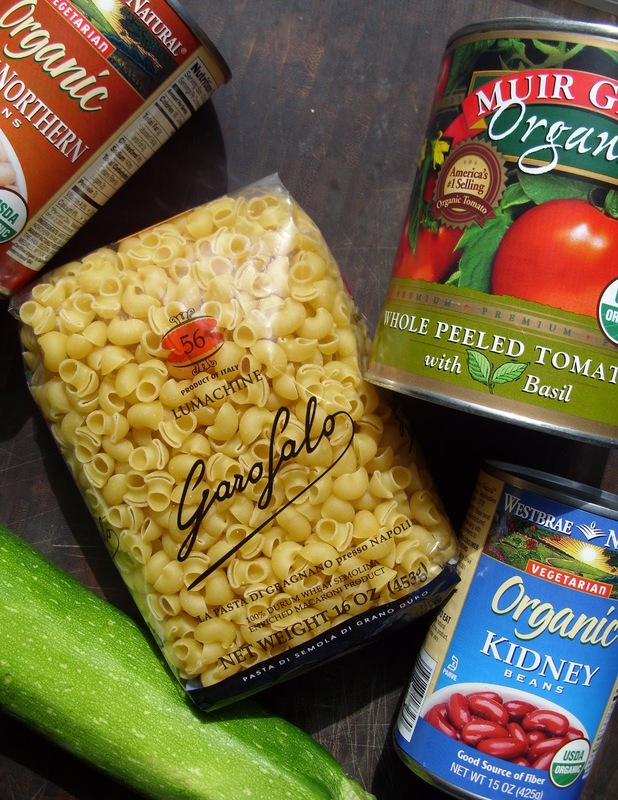 PS - A lot of times you guys ask what ingredients we use to make our food. So I took a photo of some of what went into our Minestrone. This looks so hearty and delicious! 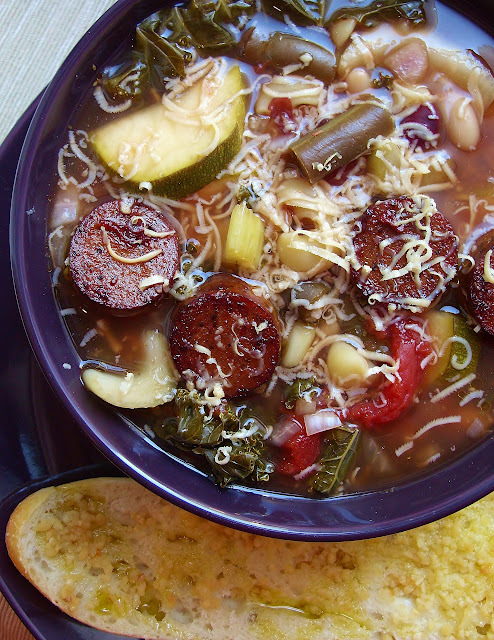 My mouth is seriously watering for some of this soup right now! Man I totally dig you. If it wasn't for the amazing food you share with us, it'd be for the Doctor Who references alone. I love it and love that you call it a Tardis! I'ma Tennant and Baker girl; you?